What do you give your growing child? 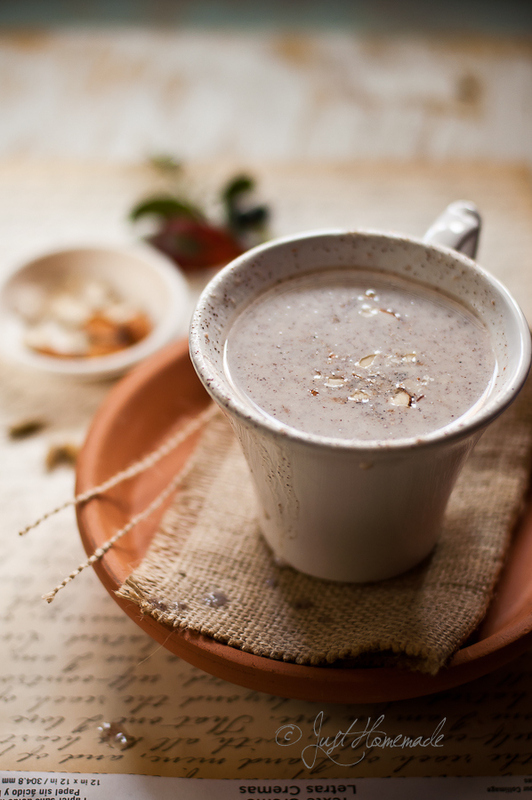 What is it that you swear by – Chocolate Horlicks, Complan Kesar Badam, Milo, MTR Badam mix, Bournvita or what else to go with milk? I mean, most of us have grown up drinking milk with one or the other of these beverage mixes and we have our favorites in continuing that tradition of a nutritious drink for our own children. Right? Besides, readily available beverage mixes in a way take the tension out of the morning and evening drink time. Scoop, stir. drink. done. Well, what if they are not available? Suddenly, an autopilot task turns into a nightmare! This happened to me recently when the local Indian store that I shop at ran out of stock of my little girl’s favorite drink mix. After much pondering and mulling over, I surprised myself when I recollected her first solid food – Raagi porridge. 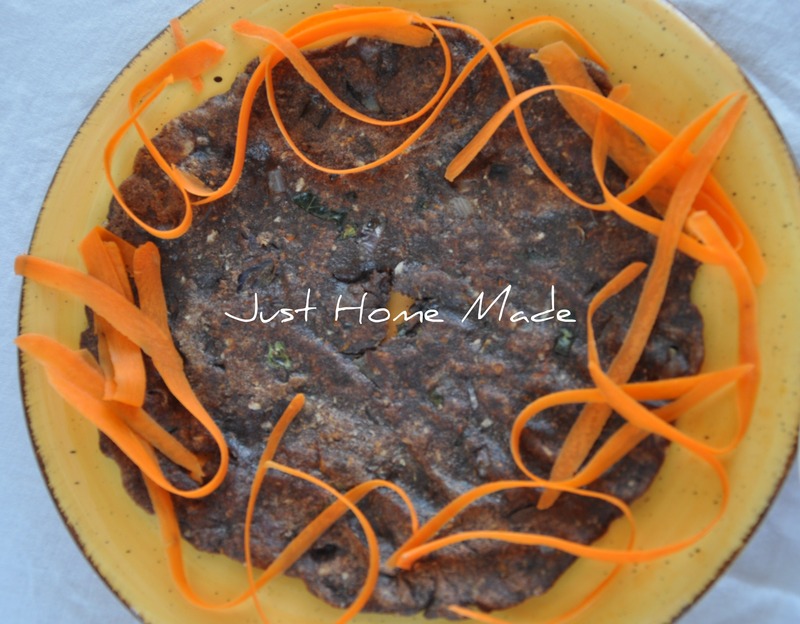 Super easy, nutritious, home made and not-so-time consuming. It was there all the while and had never occurred to me! And that’s how this Raagi malt recipe was dusted and revived. I had had it during my school and college years, yet was completely forgotten. Thankfully, necessity refreshed my memory just in time and this traditional local staple is slowly becoming a part of our daily consumption. Finger Millet aka “Raagi” in Kannada (also Nachni in Hindi) is one of the mainstay peasant foods of Karnataka and a staple the rural people take much pride in. A gluten free cereal, owing to its low glycemic index, it is also embraced by many a diabetics as a healthy alternative. Dumpling (Mudde), porridge (Ganji), unleavened flat bread (Rotti) and malted drink such as this one are some of the most common recipes made out of this humble grain. Because Raagi is not considered a “Saattvic” grain, it never found a place in my grand dad’s kitchen. Call it a knack or an affinity, my mom however was always drawn to local foods. And dad being posted in remote villages on a central government job, gave her the right opportunities to learn local recipes which, she did without fail. Mom has cooked with Raagi for as long as I can remember. And my love for Raagi perhaps stems from her undying interest in dishing out several recipes for us during our childhood summers. This Raagi Badam Malt is an adaptation of one of her recipes and is still a very basic one at that. It is suitable for people of every age, babies ready for solids, kids, teens, adults or even old alike. It was a weaning food my mom introduced to us when we were babies and that which I swore by for my little girl as well for her first solid food. Ideally, Raagi grains are washed, soaked, sprouted, dried and milled to a fine flour and then a hot beverage is made out of it. Hence the name Malt. But, since most of us neither have the time nor the patience or even the facilities to get it milled, we could just start from readily available Ragi flour. But if do you have the resources and the time and energy, I’d definitely encourage you to do it the traditional way. If you decide to follow this recipe, consider it as a guide to make it the first time. Once you get a hang of the consistency and the taste, adjust the proportions to suit your needs and whims. Just like how everyone likes their tea a certain way, Raagi malt should be tailored to one’s taste. Thin or thick, more milk, less water, more or less jaggery, no cardamom or whatever you fancy. The recipe I have given is what I follow for my little girl. Feel free to replace whole milk with the milk of your choice. The proportion of water to milk will have to be adjusted accordingly if the milk is nonfat or a non dairy milk. Now, Raagi Malt is quite filling. One cup can see you through a couple of hours easily. When not cooked properly though, Raagi can be difficult to digest. Roasting the flour and then cooking it in boiling water or milk is therefore important to make it easily digestible. December 10th is Terra Madre Day, a worldwide event held every year to celebrate local food. “Terra Madre” is italian for “Mother Earth”; On this day, the global Slow Food network comes together to promote good, clean and fair food. Supporting local foods from our local roots is close to my food philosophy and what I believe in as well. It is such a pleasant co-incidence that I was about to publish this Raagi Badam Malt post today when it happens to be Terra Madre day. Nothing celebrates local karnataka food much like Raagi does and sharing a local recipe that I have grown up with is my way of a minuscule participation in this larger movement. * Even though the recipe is for a single serving of one cup, I have used a larger quantity of Raagi flour and almonds, so you can make ahead and store them and use only the required quantity for making the malt as needed. In a skillet or kadai, dry roast Raagi flour on medium heat until the raw grassy smell goes away, being careful not to burn it. Once cooled, store in an airtight jar. 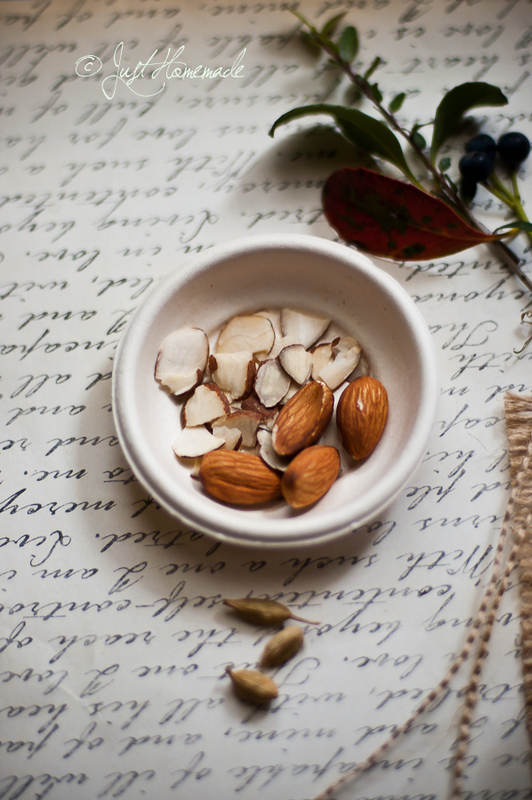 In a spice grinder or small mixer jar, pulse the almonds with the cane sugar to a fine meal. Take care not to grind it too much or it will end up in almond butter. 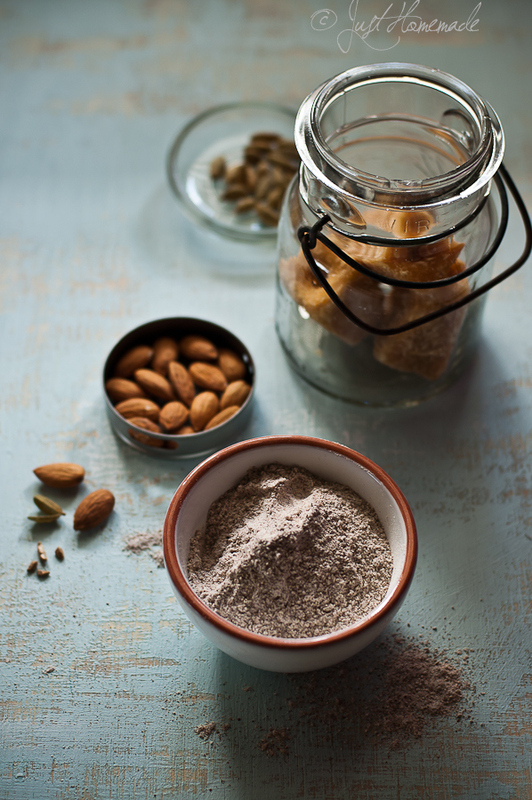 Sugar helps in grinding almonds to a fine powder. Combine water and milk in a heavy bottom saucepan and bring to a boil. Meanwhile, in a small cup, mix roasted Raagi flour in 2 tbsp milk making sure there are no lumps. Pry open the cardamom seeds from the pods and store the skin to be used in tea or a recipe later. In a mortar and pestle, grind the cardamom seeds to a fine powder. When the milk comes to a boil, reduce heat to low and stir in the Raagi milk and continue stirring intermittently to see that no lumps are formed, until cooked or about 5 mins. If you see any lumps, just smash them with the back of a spoon to dissolve. Switch off, add in jaggery, almond meal, ghee (optionally) and finally sprinkle ground cardamom and mix well. 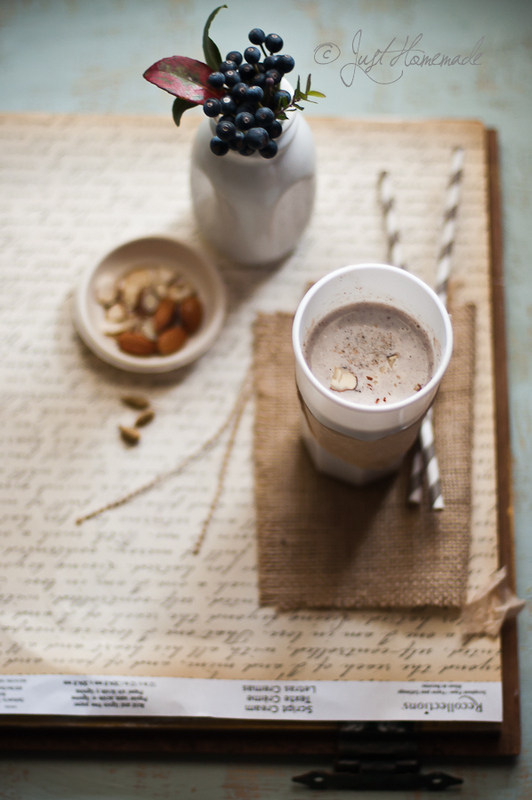 Serve hot or warm garnished with powdered or slivered almonds. If you so like it, sprinkle a dash of good quality cocoa to add a chocolatey twist. Store the almond meal and roasted raagi flour in the refrigerator if not planning to consume within two weeks. The same recipe can be used with whole wheat flour as well. You could even go for a half and half mix of whole wheat and Raagi flour mix, if you are gluten tolerant. If you plan to use non fat milk or any non-dairy milk, omit water completely and use an entire cup of the milk itself. Cardamom flavor is best when freshly ground. For this reason, I wouldn’t buy ground cardamom as it tends to lose flavor over time and I never need so much at any given point for any recipe. Substitute jaggery with any unrefined sugars like succanat or brown sugar if you have no access to it. It is easily available in Indian stores. Lovely as usual Radhika. I don’t know what I would have fed my son if not for Raagi porridge! My recipe also includes moong, wheat and peanuts all sprouted! And some nutmeg for flavor. Try it this way and you’ll be surprised what a difference these make and not to mention the increase in nutritive value!! Swathi, nutmeg sounds really interesting. Got to certainly try that. Yes, same pinch! Truth be told, it started in the name of Raagi and slowly wheat, boiled rice(kusublakki), moong, Chana, what not got included.. It was a dozen odd grain affair, if i’m not wrong. Our ( u & i) kids were pampered, looks like! Thank you Fabio! Welcome aboard.. So happy that yours is the only other blog which has a terra madre post today! I’m so bad at following events, though I wish I could be a part of all of them, each time. This is just a pure co-incidence! Ha! how amazing is that! Love her “fast food” concept. Thanks Chin. Cut or paste, know that I love love reading your comments.. Nothing is more heavenly than a cup of Ragi malt!! Loved the presentation Radhika!! Agree cent percent on that Nandita. Have replaced my evening tea with this malt off late and it really feels heavenly. Amazing photography Radhika!! Just lovely! 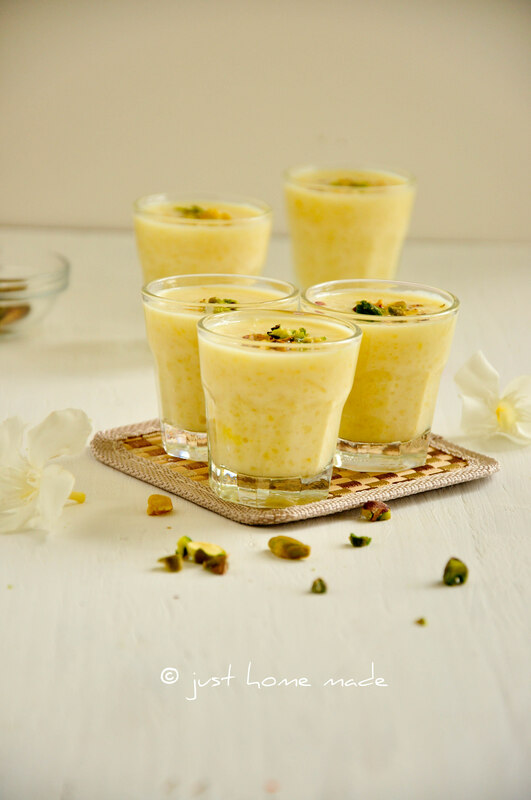 beautiful click and such a great recipe. I discovered ragi while we were in Bangalore and have been using this ever since. 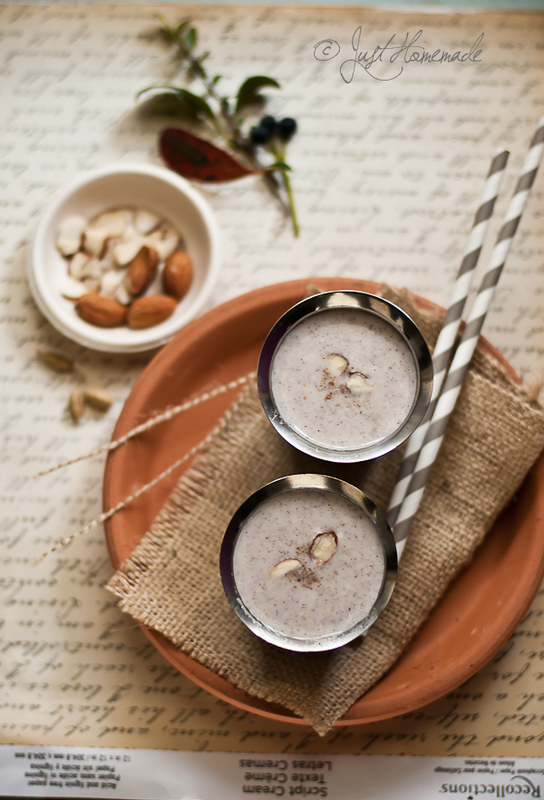 often make ragi malt but adding badam to it is a great way of upping the nutrition. Thanks Sayantani. pleasantly surprised to hear, Ragi being not such a typical restaurant category food. I know! right? So many of us can relate to Raagi malt or porridge predominantly as baby food! 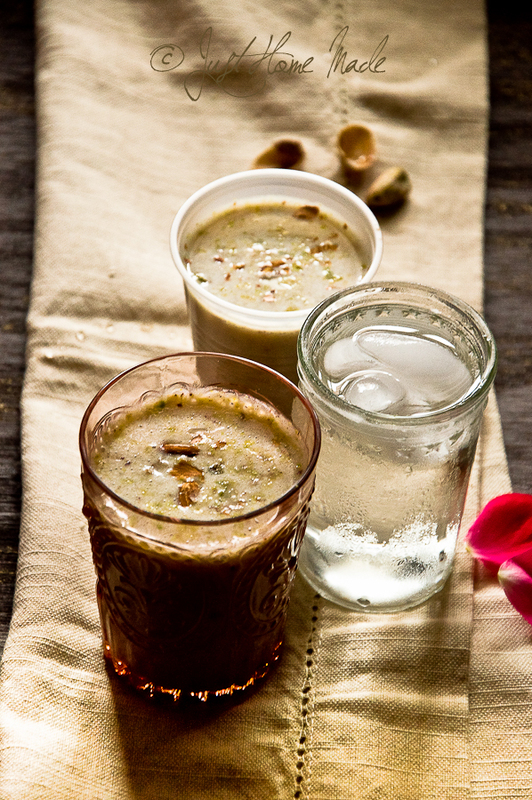 BTW, This recipe does have jaggery in it as well – my sweetener of choice too! Lovely entry on DMBLGiT January 2013, Radhika ! Thanks Tika. Glad you stopped by..